A whole new world has opened up south of Chicago's financial Loop distict. This was an area once reserved for the stupid or the brave and even in my time in the city the development and augmentation of the streets south of Congress Parkway has been amazing. 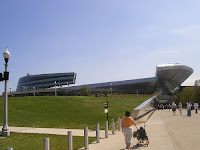 The renovation of Chicago Bears' Soldier Field in 2004 broadened the appeal to both locals and visitors and developers soon caught on building new and modernising old apartment buildings. Back in the day the South Loop was one of Chicago's first ever residential areas. Initially it was families displaced by the Great Chicago Fire in 1871, but later the railways came and they marked the southern edge of the buisness district. More rail tracks track radiate in more directions from Chicago than from any other city in America and originally the South Loop grew around railroad tracks and stations serving freight depots and passenger stations. Still today Chicago is the most important interchange point for freight traffic between the nation's major railroads and it is the hub of Amtrak, the intercity rail passenger system. Dearborn Station was one of the original train stations designed by Cyrus L.W.Eidlitz and opened in May 1885. The station was closed on 1971 after 86 years as the first step of Amtrak's consolidation of Chicago's intercity train operations and was left rotting until the mid 1980's when it was converted to offices and apartments. It has since had another spruce up and is now a signature beacon to the neighbourhood. Back in the late 1880's Chicago's South Loop was also home to the nation's printing industry. High loft buildings filled the narrow blocks near Dearborn Station feeding off the important transport links, but the industry soon died after the demise of the station. However pioneering architects and developers recognized the potential of loft buildings in the area still called Printers Row. Printers Row is now a small but busy locale that extends north from the old Dearborn Station and is home to many beautiful loft buildings and numerous bars and restaurants spanning all the way up to the Blake Hotel on Congress Parkway and one of my favourite restaurants Custom House. Printer's Row retains its connection to its print and literary history with an Annual Book Fair, held each June. Started in 1984, the fair draws booksellers and readers from all over the city and surrounding suburbs and hundreds of stalls span both Dearborn and Harrison Streets. Another facet of life in the South Loop in the late 1880's was the goings on at The Leve e, the city's most infamous vice district. Brothels and gambling parlours hung around for quite some years until the customers, like the area, dried up. The high-rises are the most visible newcomers to the South Loop, towering over the cityscape with their domed tops and their glassy sheens. I read recently that six of the ten biggest-selling condominuim buildings in the city in 2006 were in the South Loop, although as elsewhere sales have considerably slowed in the last 6 months. Not suprising as there has been so much construction activity in this area. 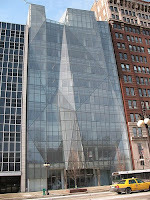 One of the coolest buildings (right) is at 610 S. Michigan Ave occupied by the Spertus Institute of Jewish Studies. Sure, the inside will not appeal to the masses but the environmentally sustainable building is a masterpiece, shaped with cascading faceted glass, built from 726 windows in 556 different shapes. As architecture flourishes upwards so does what is happening at street level. Like other developing neighborhoods, the South Loop is farther along on restaurants than on retail. The real dining scene started around 10 years ago when local restauranteur Jerry Kleiner launched Gioco and just a year or so after the 100-year old Chicago Firehouse was turned into a sumptuous restaurant called incidentially the Chicago Firehouse (left), the building's facade has kept all of it's original splendour. Retailing has not been as dynamic, although in recent years some of the larger chains have found homes in the neighbourhood including a massive and very nice Whole Foods. A huge cinema complex is also mooted but the South Loop doesn't yet have any individualistic boutiques that can distinguish one neighbourhood from another and give it that kind of hip feel. However new residents and increasing foot traffic should bring the neighborhood another step closer to maturity. 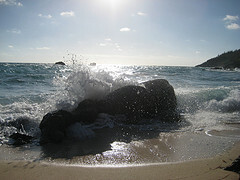 The largest land owner in the district is Columbia College, the biggest arts and communications college in America. Columbia owns more than 1,200,000 square feet in Chicago's South Loop, with amazingly more expansion plans. The Auditorium Theatre occupies a big space in the other big university complex in the South Loop. The Roosevelt University actually holds classes in the theatre as well as it being the current home to the Joffrey Ballet. I saw Giselle there in October. Famous Blues singer Buddy Guy has his club at 754 S Wabash Ave. Arguably Chicago's most famous Blues club with fascinating memorabilia adorning the walls and southern soul food served at night but arrive early as this place gets packed. Buddy Guys has been down here since 1989 but there are plenty of fantastic new entries on the South Loop restuarant and bar scene. 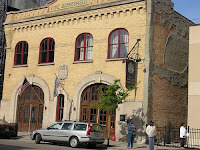 For beer Hackney's has a wide range of draft beers and is in one of the oldest buildings in Printers Row. For food Zapatista is a great Mexican place with guacamole made for you table side and a good wine list and I love Eleven City Diner (right), superb anytime of the day. I must mention Hi-Tea as well, as it is owned by a friend's brother. It's excellent for a cup of cha and a sandwich.